Are you prepared for the next breach? Only 6% of leaders say yes. Information security—or, the lack of it—is firmly on the radar for business and IT leaders in organizations of all sizes and in every sector. Many fear that their companies are ill-prepared to prevent, detect, and effectively respond to various types of cyberattacks, and a shortage of in-house security expertise remains of widespread concern. 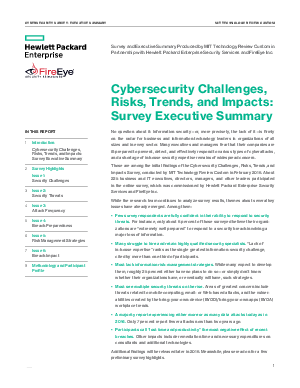 Those are among the initial findings of the Cybersecurity Challenges, Risks, Trends, and Impacts Survey, conducted by MIT Technology Review of approx. 225 business and IT executives, in partnership with Hewlett Packard Enterprise Security Services and FireEye Inc.